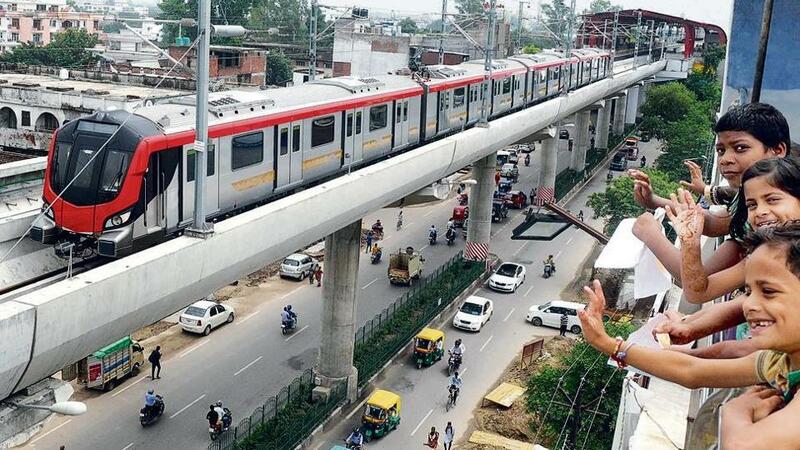 Lucknow: The Lucknow Metro Rail Corporation (LMRC) has achieved another milestone while completing the work for the underground section between the Charbagh Metro station ramp & the K. D. Singh Stadium Metro station ramp by completing the track laying work in the UPLINE tunnel of this underground section. LMRC is using the Mass Spring System (an elastomer pad of 25mm thickness) below the track bed for construction of track. Mass Spring System, procured from Austria, eliminates the problem of vibration and sound in adjoining structures of the underground portion. For the construction of track, first of all the Elastomer Mass Spring System sheet is laid, then reinforcement mesh is laid over this and then it is filled with concrete up to the rail bottom. Rails are wielded continuously to avoid any joint in the rails. The track laying work in the DOWNLINE tunnel of the underground section is also in its penultimate phase and there is a clear possibility of its completion within the next 10 days. Besides track lying, Lucknow Metro has also completed almost 70% work of the Rigid Overhead Catenary System (ROCS) i.e. overhead electrification which is being carried out inside both the tunnels for traction power. Apart from this, the work of entrance and exit gateways at all underground stations is almost complete. More than 50% of tiling and beautification work at the concourse and platform area of all the three underground Metro station (i.e. Hussainganj, Sachivalaya & Hazratganj) has also been completed. The construction work of all the important rooms related with Metro rail operations such as the Electrical, UPS, DV Room, Telecom & Security Room etc. is also being done at a fast pace.